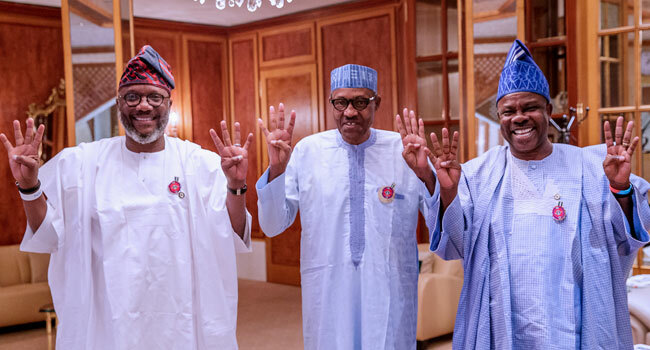 President Muhammadu Buhari was quickly shielded today by security agents in Abeokuta, Ogun State capital, when missiles flew towards him as he raised the hand of the All Progressives Congress (APC) flagbearer for the governorship election, Mr Dapo Abiodun. The programme was brought to an abrupt end as the President and other party leaders were being stoned by members of APM who are Abiodun’s rival after the Ogun State governor, Ibikunle Amosun had washed the parties’ dirty linens in the public at the rally where he was openly condemned by the former governor of Osun State, Abdulrauf Aregbesola. Amosun had openly showed while speaking at the rally that he would not allow Abiodun to be presented as the APC flagbearer.